Indoor lime trees are hardy, requiring little care to thrive. Aside from producing fresh fruit year round, a lime tree adds a light, sweet fragrance to the home and is aesthetically pleasing, with glossy green foliage and bright green fruit. 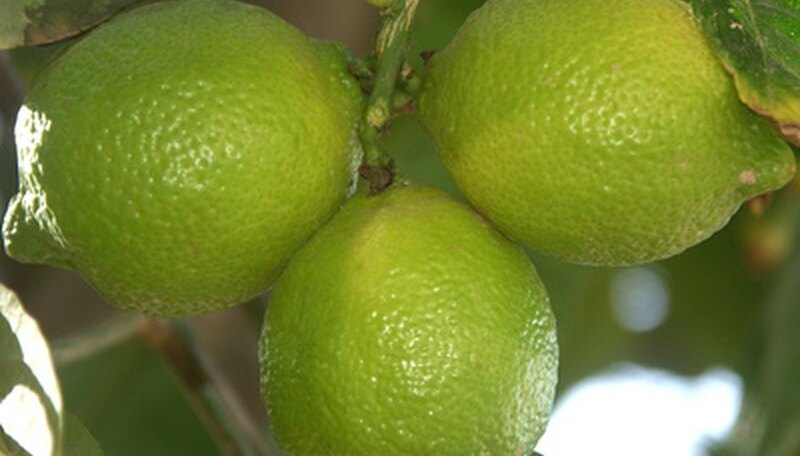 There are several varieties of dwarf lime trees ideal for growing indoors including: Kaffir lime (Citrus hystrix), Mexican or key lime (Citrus aurantifolia) and Persian or Tahiti lime (Citrus latifolia 'Bearss Seedless'). Dwarf lime trees can grow from 3 to 6 feet tall. Grow an indoor lime tree in a container that is no more than twice the size of the root ball. Be sure the container has drainage holes in the bottom so the tree's roots are not water logged. Use a well-draining soil that stays moist, but not soaking wet. Place the container in a sunny window where it will receive indirect sunlight each day, all day long. A south-facing window works well. If necessary, the lime tree can be grown underneath fluorescent lights with 40 watt bulbs. Water an indoor lime tree consistently, every few days, or when the soil has dried out down to about 2 inches deep. Too much water causes the tree's leaves to turn yellow and too little can cause the leaves to wilt. Provide humid conditions by setting the container on a pebble-lined tray filled about halfway with water. Do not let the bottom of the container sit in the water in the tray. Mist the plant every other day to help provide adequate humidity. Fertilize with a citrus tree food that can be purchased from a local gardening store. Apply the amount recommended on the package once a month and water in well after applying. A complete slow-released fertilizer can be used instead. Place the lime tree outside on a patio or deck during a warm, sunny day. Do not over water an indoor lime tree or it can develop root rot.